Wonderful walks on the criss-crossing footpaths on the meadows in Olney. Great for a short walk, or follow link below for 8 mile circular walk. OS Explorer map for this walk is sheet no. 207. Emberton Country Park is a taste of the country, just a short walk or ride from Olney. You can take several circular walks & rides from here to neighbouring villages. (O.S Landranger map for Northampton & Milton Keynes (sheet 152) covers the area. A village about one mile eastward from Olney - a pleasant stroll over the river from Olney. A peaceful lakeside walk, with chances to spot all kinds of wildlife - with bird seed usually available to buy, and a cafe. Also has a mountain cycle track, skate ramp and kick board. 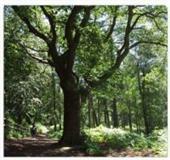 Experience the 'Tree Top Walk' - a wooden platform that takes you above Salcey Forest. For children the fallen down trees & playarea are engaging and there are plenty of trails. Olney is a perfect base for the Three Shires Way. This bridleway has tranquil landscape and parts of ancient woodlands. Whether you want to walk, cycle or ride, the Three Shires Way takes you through some of the loveliest of Buckinghamshire, Bedfordshire and Northamptonshire along its 49 miles. The Emmaus charity supports previously homeless people. The site in Carlton has a shops and bsitro. There are many walks around the site, you are welcome to park and get a map at the Bistro. A walk & picnic Site in Bedfordshire with lovely views north across the Ouse Valley to Odell. An enjoyable place to wander. An amazing long distance route which passes through 3 counties. 40 miles in total, the route is split into five sections, with walks of between 8-10 miles. OS Explorer maps 192, 193 and 208. The trust manages the huge number of parks in MK and offers a great range of guided walks, special events and family theme day. Surrounded by lovely countryside and lots of wildlife and with a massive outdoor adventure playground for children. There are walks, an orienteering course and picnic site, close to Junction 13 of the M1. One of the largest areas of woodland in Bedfordshire - a very popular place for off-road cycling, walking and horse riding with miles upon miles of bridleways as well as great views. Millenium Country Park has a Forest Centre & 600 acres with traffic free trails to cycle or walk. There's been massive tree planting to create a new forest for this Century; the trees are young but growing! These ancient woodlands offer a lovely valley and meadows across 80 acres and a mixture of Georigan parkland and heath and grasslands. There is a wonderful diversity of wildlife and rare oak trees. This is a country Park offering some different experiences: from the sensory garden to the sculpture trail. You can try yourself out as the human sunclock or tackle the mini turf maze.